All artwork and jewelry is handsculpted by clay artist Alicia Merritt. Alicia has sculpted thousands of items for her customers worldwide, and is pleased to share her creations here with you! Over EIGHTY species of parrots are showcased on this site, and the list is constantly growing. To view examples of pins created in your bird's species, browse the SPECIES page. No molds or paints are used in Alicia's Creations, just vibrant, lightweight polymer clay! Each color seen is a separate piece of colored clay. Every item is one of a kind, so your custom order will be unique! See the FREQUENTLY ASKED QUESTIONS page for more information. 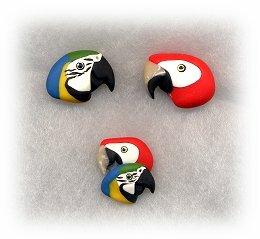 Your choice of tie tacks can be custom made in nearly any parrot species, hand sculpted from polymer clay. Tie tacks are available with the bird face only, not full body. Most tie tacks measure about 3/4" to 1", depending on birds. Photos are examples only, and may not show actual sizes. Bird face measures 3/4" to 1", with tie tack pinback. Two bird faces nestled together, with tie tack pinback. An optional glossy finish can be applied to your ornament, for a shiny finish. Please add $2.00 per bird face.